Promotions is a method to temporarily increase the strategy score of selected products in a market. It is useful for use cases such as promotions of upcoming external campaigns, stock clearance of specific products, or promoting certain brands or type of products. Promoted products will gain positions in search results, category pages, and other locations where promotions are supported. All promotions are managed in the Business app. Before a promotion can be created, the Admin app must be fully configured. Access for users to the promotions tab is set in the admin app User management tab on a per user basis. Each promotion is identified by a name and has start and end time. The time setting enables a user for example to schedule promotions to start or end at out-of-office hours. A boost level is set to determine how the selected products will be promoted. Statistics are collected during the promotion and can be measured. If a product is part of both a promotion and a demotion at the same time, the strategy score from the demotion is used for the product. A promotion can have three different levels: low, medium, or high. The high boost level is recommended in most use cases. Low - During the promotion, the strategy score of each promoted product is adjusted to be higher than ~90% of the products that currently have a higher strategy score. Medium - During the promotion, the strategy score of each promoted product is adjusted to be higher than ~99% of the products that currently have a higher strategy score. High - During the promotion, the strategy score of each promoted product is adjusted to be higher than all products which are not promoted. 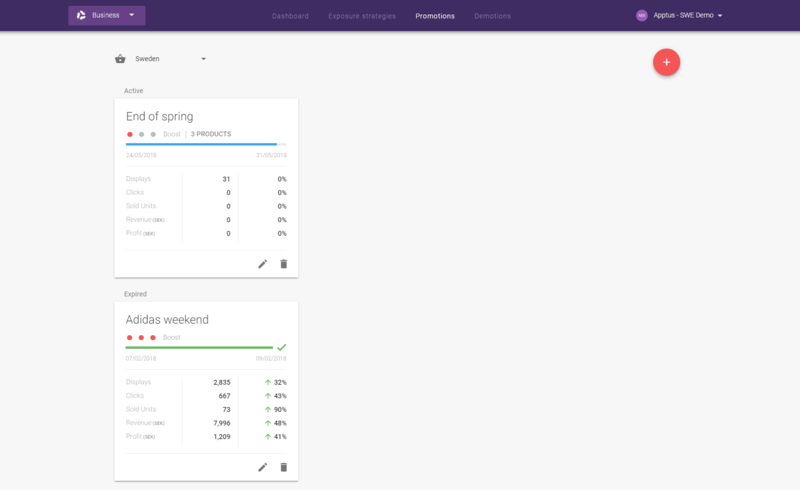 During a promotion period, aggregated statistics for all promoted products are collected for displays, clicks, sold units, revenue, and profit. Revenue and profit are shown in the currency configured for the current market. Statistics can be measured to show the impact of the promotion. When activating measurements, 80% of the sessions will show the promotion and 20% will not. The impact is measured by comparing the statistics from sessions with promotions to sessions without promotions. The aggregated statistics of a promotion are based on all sessions, i.e. both sessions with and without promotions. Notification set-up and implementation affects the statistics collected. Incorrectly set-up notifications will result in incorrect statistics. It is recommended to always measure promotions. Products used in a promotion can be either handpicked or included (or excluded) by rules. Products can be handpicked for a promotion. The Search box can be used to search for products using the search attributes configured for the products, including product_key. Handpicked products can be removed from a promotion directly from the main Edit promotion dialogue window. 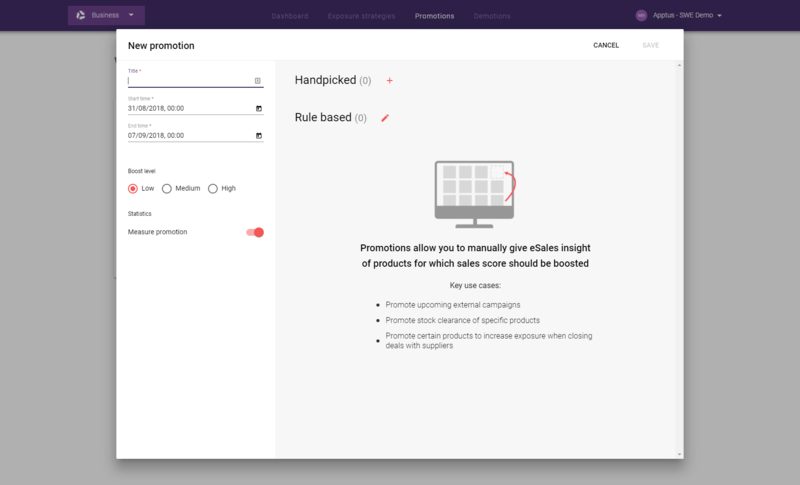 Products can be included in, and excluded from, a promotion using one or more rule sets. 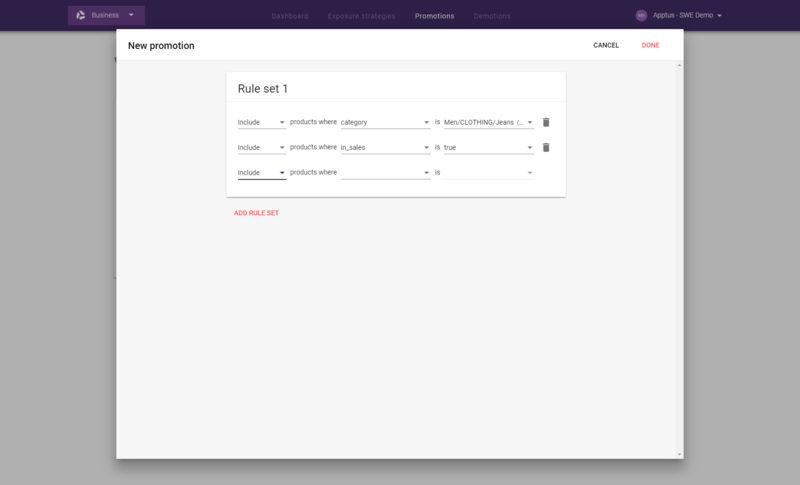 A rule set can include several rules where each rule can either include or exclude products where a configured attribute, such as a brand name or a product category, has one or more values found in eSales. If more than one value is selected for an attribute in a rule, the values are to be considered as using the logical OR operator. I.e. if a rule with the attribute brand has both Adidas and Nike as values, products with brand configured as Adidas or Nike will be selected. Each additional rule in a rule set is based on the data returned by the previous rule (logical AND operator). The final product selection within the rule set is based on the data returned by the last rule. This is useful when narrowing down a product set. For example, a rule set has two include rules where first rule has the attribute brand and the value Adidas, and the second rule has the attribute colour and the value Black. The final product selection within the rule set are products with the colour set to Black from the the data set where the brand is Adidas. It is not recommended to use different rules using include with the same attribute within a rule set as they most likely return no products. I.e. if a rule set has two include rules where first rule has the attribute brand and the value Adidas, and the second rule also has the attribute brand but the value Nike, it will not return any products at all. This is because no products with Nike as brand are present in the data returned where brand is Adidas. Several rule sets can be used simultaneously. The rule sets operate independently of each other (logical OR operator). A rule to exclude products by their id's can be used if certain products, that are selected due to the inclusion rules, are deemed unfit for the promotion. The key use cases for promotions includes managing stock level and promotions of seasonal wear. Read more about use cases and best sales practices on the Promotions page on Apptus.com. Depending on what panel is used, promotions are utilised either fully or partially. Panels that partially utilise promotions, such as the Autocomplete panel, use product promotions on product backfill. Multi-level sorting will affect promotions.